Let Us Set up an Estimate! We would be happy to take a look at your project, answer any of your questions, or give you a quote. Business by referrals… No Advertising… Just referrals..
A special thanks to our returning customers! We earned the 2012 & 2014 Super Service Awards from Angie’s List. "There is simply no substitute for the warmth of hardwood floors." No matter what kind of home you have... wood floors add beauty and value. 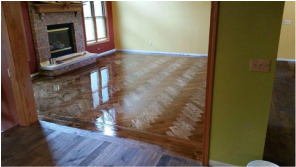 At Peacock Floors, we are entirely devoted to installing and refinishing hardwood floors throughout the Greater Cleveland area. We are not a floor refinishing franchise or a large flooring business installing all kinds of materials. We specialize only in wood. Peacock Floors is owned and operated by wood craftsman Jason Peacock. We are proud to be small and personal… with a unique passion for wood and an expertise we love to share. Call us ... for a free estimate on installing new wood flooring or replacing and repairing your existing wood floors. No dust ... no worries. In the floor sanding process, we are experts at controlling dust. We use a vacuum unit that results in a virtually dust-free environment. Our dust containment system is state of the art... so you can be confident dust is kept out of the home as we refinish and sand your floors. "We live in a 1930s era home in University Heights. Peacock Floors refinished our wood floors and repaired water damage -- giving it all a warm look with grain that pops out and looks beautiful! Jason and his crew were meticulous - no dust process and great attention to details. Very proactive, skilled craftsmen who know and love wood. We love our floors - and they are easy to clean too!"